"Intertwined with fantastic subplots, this story is raw, real, and breathtaking." "McDonell deftly handles a surprisingly complex narrative…Her characters are well developed and well deserving of empathy while not always likeable…Black Chuck surprises at nearly every turn; it's a powerful debut." "A gritty, dark mystery…McDonell captures [the characters'] diverging paths with heart and talent, exploring the secrets we keep from others and ourselves, and the decisions that determine who we are." "Atmospheric…Ojibwe mythology and language add texture as the mystery surrounding what really happened to Shaun, and who—or what—is at fault, deepens." "Dynamically complex characterization and storytelling…brooding and absorbing." "This novel is Orca at its most mature. The characters are living on the edge, with such raw intensity that it is painful to remember that they are still teens…As these four teens struggle with their demons, we are pulled through their living nightmares by McDonell's harrowing depiction, and hope for their sakes that they can each find their road." "A book unlike anything I have read before…McDonell has developed characters who are diverse, multidimensional, and flawed, which makes them relatable…Black Chuck is an engaging and diverse book that would be a welcomed additional to any classroom or school library. Highly Recommended. " "Superb debut novel; the pain and angst of both Ré and Evie is palpable, and the struggles they face within their respective relationships are real and nuanced…This is a brutal, heartbreaking, and yet strangely uplifting novel about the consequences of lies, the gravity of love, and the courage it takes to prevail over self-condemnation." "McDonell provides a strong sense of character for each of her players, drawing them to a crashing conclusion through a series of impactful events. The author also displays an adeptness in handling themes such as inevitability, loyalty, and guilt, making this a read that sticks in the gut…This book delivers on a stirring psychological drama fans of Carol Plum-Ucci's The Body of Christopher Creed and of the CW's Riverdale will tear through." "[A] beautiful and painful novel…McDonell's background in creative writing and poetry is evident in this excellent debut novel…[Réal] is a character I don't think I've really experienced before…He's a character who I felt bad for, cheered for, wanted to slap at times, and who I needed to see find some hope in life…A strange, brutal, heartbreaking, and strangely uplifting novel about lies, love, friendship, courage, and the struggle to overcome guilt. Recommended." 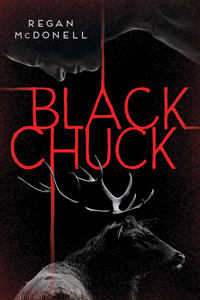 "Black Chuck is easy to get lost in, haunting, hard not to think about. This story is compelling, chillingly real and sad. Timeless, yet contemporary. A pleasure to read." "McDonell has captured the brashness and insecurity of adolescence in this gravel-splattering joy-ride. Four teenagers attempt to discern what is real from what is not after trauma threatens to rob them all of their futures." "Black Chuck is a stunning work of prose—poetic and haunting, tender and gritty—this is a remarkable novel." "A darkly atmospheric story, filled with heartfelt, yet perfectly-flawed characters. I loved it."